Hey there! Thanks for dropping by Chicken Soup for the Sole! Take a look around and grab the RSS feed to stay updated. See you around! I have mentioned before that one of the most supreme delights of cooking alone is the absence of mystery. I know what I like. I know the amount that I like things in. My only dietary restrictions are the obligatory exclusion of olives (of all sorts) and mayonnaise (except for dill mayonnaise, which is perfectly acceptable). When I go into a kitchen to cook for myself, the only question I have to ask myself is what I’m in the mood for. Sometimes, I have a stare down with everything in my cabinets. At others, ideas simply bubble to the surface of my consciousness like perfectly cooked ravioli. Admittedly, cooking is probably my greatest form of self-love, and for someone who spends so much time thesising, reading, writing, and working at the Writing Center that they have become known to their undergraduate friends/coworkers as “the vampire” (all in good fun, I have been assured, though the label is in part due to the darkness of my apartment and mostly due to my resulting pale complexion), a hot meal is the knife that cuts through the cold, buttery stress of my crazy day. It is how I survived graduate school. Exam week is always interesting to witness, especially from my standpoint. My father once told me to run the race of life like it’s a marathon, but even during the first few weeks of the semester, I typically find myself sprinting through hundreds of pages of reading daily, scrawling short papers at an alarming rate. Much like the rainy, cold weather of this southern Michigan June, the conditions of my final semester were not favorable to sprinting. For once, I had to run the marathon. My weekly writing and reading assignments were completed a mere day or so before they were due. Add in finishing my thesis, and you are guaranteed a recipe for at least some chaos, sort of like slicing one too many onion in a saucepan that is already three sizes too small. Toss it wrong, and on top of still having to cook dinner, you have to clean up your own mess. As with most things I have finished in my life, I don’t really think about how I do them. I’m not really sure how I wound up with a job in Japan. Was it luck? Hard work? A combination? Some cosmic force guiding me like a lost lamb or dragging me along on strings, a limp puppet? It is the same with graduate school. Trials are often the hardest when you are neck-deep in them, just ready to sink below the surface. Then, there is the obligatory breaking point. After days of being sliced at by everyday rigors, the right knife–still sharp enough to cut but dull enough to lack the poise of its sharper cousins–cuts you deep. For me, this was April. The conclusion of the thesis. I had to get it right the first time. Time–it was running out. My hideous lime green wall clock was ticking, ticking, each passing second a derisive laugh, a reminder that my best was not enough. The e-mail came back, and beneath the constructive criticism, I forced a message into it. I was a failure. It was over. There was nothing left to do but weep. Weep openly at my keyboard. This was it… my one chance, and I blew it. Surely, this would send my life spinning off into a catastrophic black hole from which I would never emerge. But this is the real test of dedication. In a moment when everything was eroding around me, I dried my eyes after letting myself have five minutes, engaged in a phone conversation with Melissa to take my mind off things, dusted myself off, heaved myself up at the keyboard, and kept going. This thesis was not going to beat me. It was fitting that I should experience this three weeks prior to my thesis defense, three weeks before most of my coworkers and peers were going through the same slump of not sleeping, skipping meals, drinking gallons of coffee, and neglecting themselves entirely for the sake of their studies. Sadistic as it is, I almost see more self-love in this than I do in cooking. The enduring dedication, even in moments of doubt and despair, and even at the cost of almost everything, opens doors that we sometimes can’t see when standing smack dab in the middle of a dark and empty labyrinth of everyday rigors. The subject of my thesis was Victorian literature, but what I learned in the process was so much more than that–and certainly a subject to explore in another blog entry. Empathy was my constant companion during exam week, when I finally caved to my complete and utter lack of motivation and exchanged my pen and pages for a pot and a wooden spoon. Instead of reserving these tools solely for myself, I share them–and their delicious results–with those still immersed in the rapid boil of finality, a prelude to some well-earned decompression. When I dug out the eight-quart stainless steel soup pot after fourteen weeks of neglect, I knew immediately that I couldn’t approach it the same way as I did when I cooked for myself. This soup was not for me; it was for my creative nonfiction class, the class that made me a blogger, which meant I had to deal with not just my own idiosyncratic palette but those of nine fellow students and one instructor. And then, there were the dietary restrictions. Some people choose not to eat different things for ethical reasons. Others cannot eat them because of medical conditions. They respect my dietary decisions and/or my lack of food allergies, one that I return, and one that I show by taking things like this into consideration when I find myself staring at my own distorted reflection in the bottom of my soup pot. Of course, it is a challenge. How can I possibly accommodate for a vegetarian and for someone who is gluten intolerant? 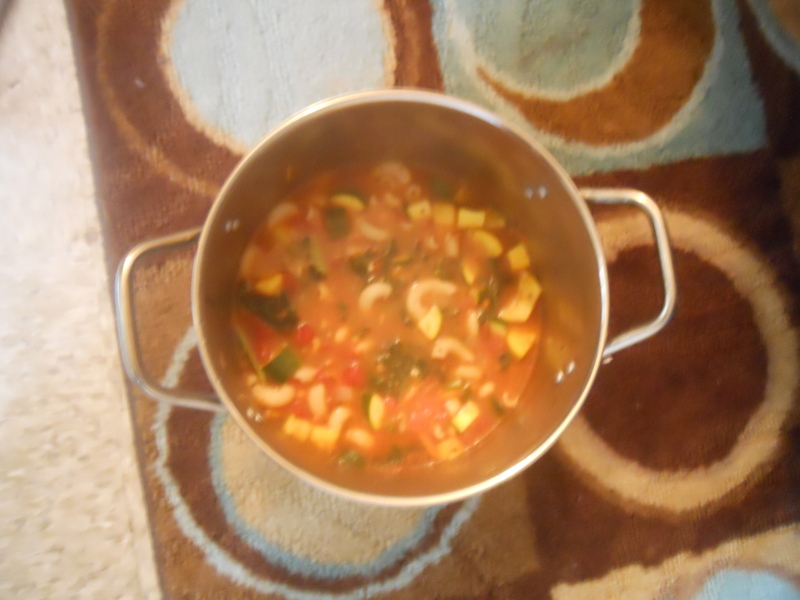 In my early days of exploring soup, I fell for Minestrone. As my tastes continued to develop, we grew apart. The challenge of feeding a class gave me a reason to get back in touch with my old favorite. What happened afterwards was nothing short of a feeding frenzy of graduate students. Some may consider it fortunate that I only got two bowls. I consider it a mission accomplished, an opportunity to give back to those who have given me such amazing criticism, those who have contributed to my development as a writer. It’s impossible to forget the taste of something so savory. In 8-quart pot, sauté garlic and onion in olive oil for about 5 minutes. Add stock, tomatoes, and spices to pot. Simmer for about 20 minutes. In a separate pan, cook 8 oz pasta in slightly salted water according to package directions. Add veggies and pasta to soup. Simmer for another 10 minutes. Add tomato sauce and water if needed to create more cooking liquid. *Note: If any of my readers know about cooking gluten-free, then they will probably tell me that I screwed up big time, the reason being that both wood (like the spatula I used to stir) and plastic (like the cutting board I chopped the veggies on) are both porous enough to absorb gluten and retain it even after being washed. FORTUNATELY, the person I mentioned earlier does not have severe reactions to small amounts of gluten. Otherwise, I would have felt guilty enough to pay the hospital bill.